The Snowy Egret is a small, active, and elegant white heron easily recognized by its dark legs and yellow feet. During the breeding season it grows long beautiful plumes on its back, which were prized as decorations for lady's hats in the late 1800s and early 1900s. Plume hunting nearly led to the demise of this egret. Fortunately, outraged citizens forced the passage of the Migratory Bird Treaty Act in 1918 and this drastically reduced the slaughter. 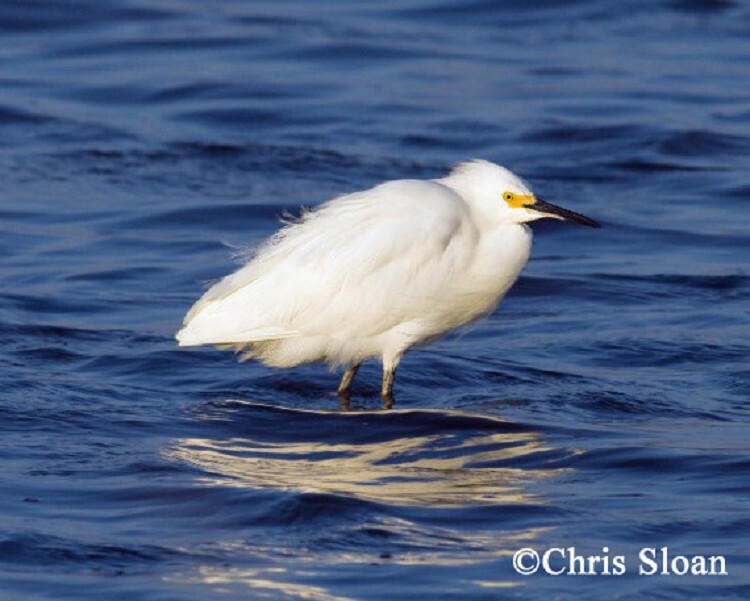 The Snowy Egret mounted a remarkable comeback throughout its historical range and beyond. It currently breeds in colonies with other herons and egrets along the Atlantic and Gulf coasts, inland along the Mississippi, in parts of the western United States, and southward throughout most of South America. This is a partially migratory species and birds breeding in northern regions winter along the southern coast of the United States and southward. 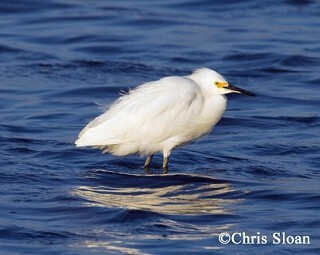 The Snowy Egret is a locally common breeding bird in West Tennessee, but post-breeding wanderers may be found statewide. It is usually present in the state from April through September. Description: This medium-sized, slender, all-white heron can be best identified by its dark bill, black legs and yellow feet. The male and female look alike. The immature Little Blue Heron (last Little Blue Heron image at link) is white but has pale greenish legs, and a pale bill with a black tip. Great Egrets are larger, have a yellow bill and black legs and feet. Habitat: Snowy Egrets breed and forage around lakes, rivers, and ponds. Breeding colonies near the Mississippi River are on islands, sandbars, or other periodically flooded sites. Nesting and reproduction: Snowy Egrets are highly colonial and typically nest in colonies with other heron species. They grow long graceful nuptial plumes in the spring that are used during courship displays. Nesting in Tennessee begins in May or June depending on flood conditions along the Mississippi. Clutch Size: Usually 3 to 5 eggs. Incubation: Both adults incubate for 20 to 24 days. Fledging: Both parents regurgitate food for the young who are able to fly in about 30 days to follow the parents to feed. Nest: Both parents build a flimsy stick platform nest, often placed in thick willow. Nest heights range from 5 to 16 feet. Island nest sites are preferred because they are less vulnerable to predators than mainland and peninsular sites. Status in Tennessee: The Snowy Egret is an uncommon migrant and locally common breeding bird in West Tennessee. In late summer and early fall it can be found in Middle and East Tennessee as an uncommon to rare post-breeding wanderer. The Snowy Egret is generally present in Tennessee from April through September. The Snowy Egret is currently state listed as In Need of Management because of its small breeding population. In 1886, egret plumes were valued at an astounding $32 per ounce, twice the price of gold at the time. The plumes were used to adorn women's hats and plume hunters in the late 1800s and early 1900s reduced populations by as much as 95 percent. After the passage of the Migratory Bird Treaty Act in 1918 populations began to recover. Best places to see in Tennessee: Reelfoot Lake area and shallow lakes and ponds in West Tennessee. In 2009, Snowy Egrets were observed nesting at Little Elder Island in Coffee County and at the Duck River Unit of Tennessee NWR as possible breeding birds. Parsons, K. C., and T. L. Master. 2000. Snowy Egret (Egretta thula). The Birds of North America No. 489 (A. Poole and F. Gill, eds.). The Birds of North America, Inc., Philadelphia, PA.